Quite possibly the most popular candy for Fall and Halloween is Candy Corn. There is just something about those little marshmallow bites of yellow, orange and white pieces of candy that we all love. They are of course available at most every store you could imagine. But have you ever thought about making your own? 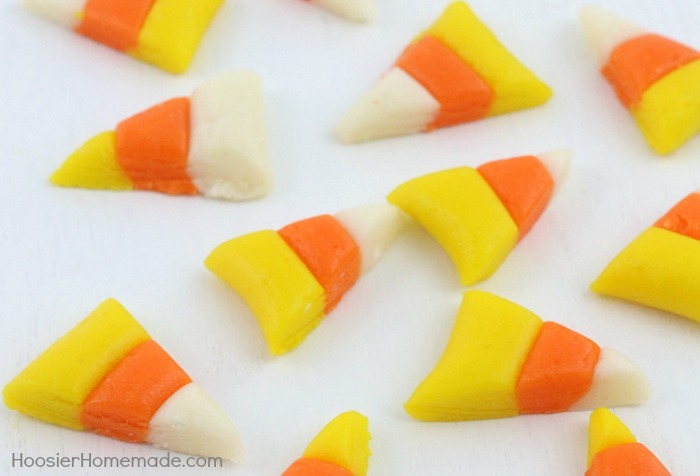 Yes – with this Homemade Candy Corn Recipe, it’s possible and pretty easy too! All you need are some basic ingredients, a strong arm and a little time. Now, I have to admit I have thought about this more times than I like to admit, however, the answer is – because you know what ingredients are in them. 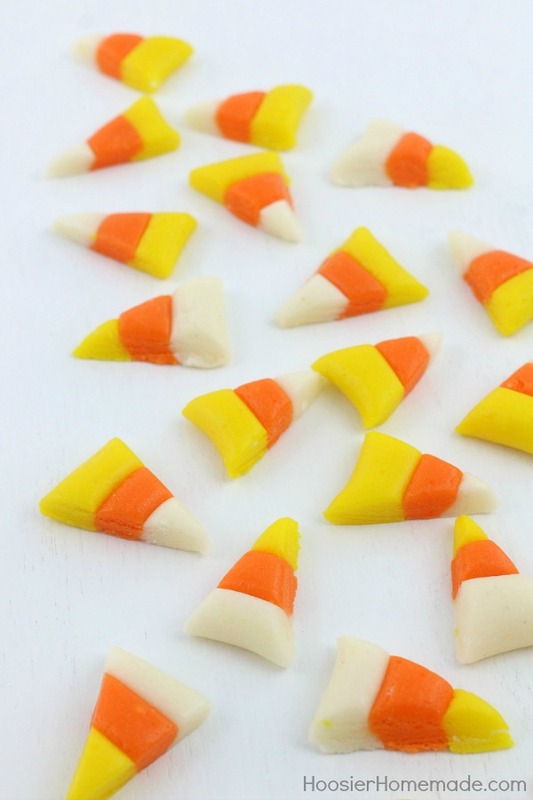 Which also goes for this Homemade Candy Corn, can you buy it already made for not a lot of money – sure – but if you make your own you definitely know what candy corn ingredients you are using and that there aren’t a bunch of preservatives in it or other ingredients that we can’t even pronounce. And besides – it’s fun to make your own. The kids love helping roll out the long ropes and putting it together to form the unmistakable candy. First, you will combine the powdered sugar, powdered milk, and salt in a large bowl and stir to combine. On the stovetop, combine the butter, corn syrup and sugar and boil for about 3-4 minutes. It’s best to use a candy thermometer, cook until it reaches 230 degrees or the soft ball stage. Remove from heat and stir in the vanilla. Carefully pour the mixture into the powdered sugar mixture. This is where the strong arm comes in. Grab your hubby if you need help and stir the mixture until well combined. 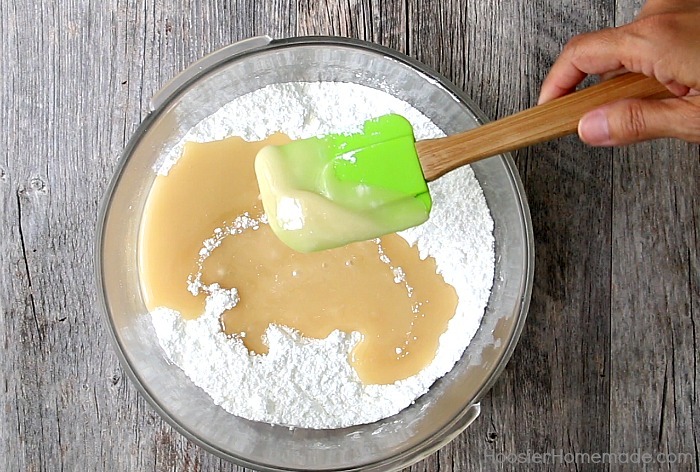 Turn the mixture out onto a piece of wax paper and let cool until you can easily handle it, about 10-15 minutes. Divide the mixture into thirds and color two of pieces with yellow and orange, kneading until well combined. Then roll each piece into ropes, place the ropes together and pinch them slightly until they stick together. Flatten the ropes and cut into triangles. Follow along with my Candy Corn Pinterest Board! 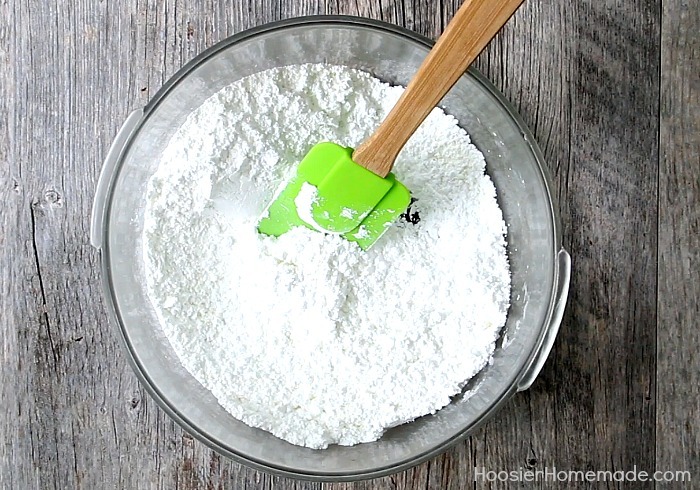 In a large bowl, combine powdered sugar, salt and powdered milk. In a medium saucepan, combine sugar, butter and corn syrup. Bring to a gentle boil, constantly stirring, turn down heat and continue boiling for about 3-4 minutes. 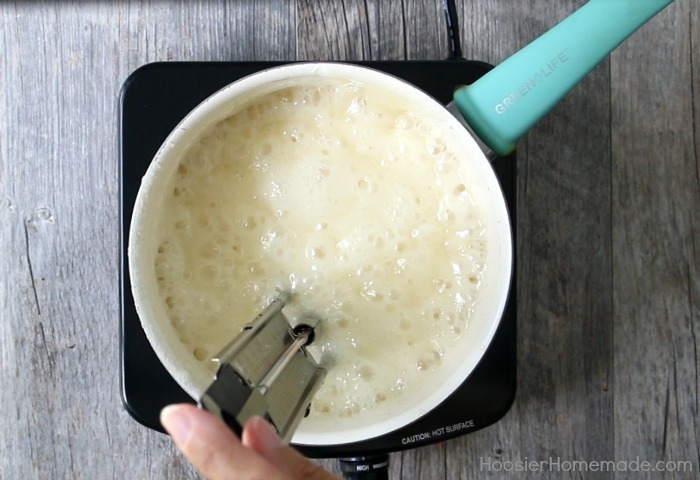 Mixture should read 230 degrees on a candy thermometer. 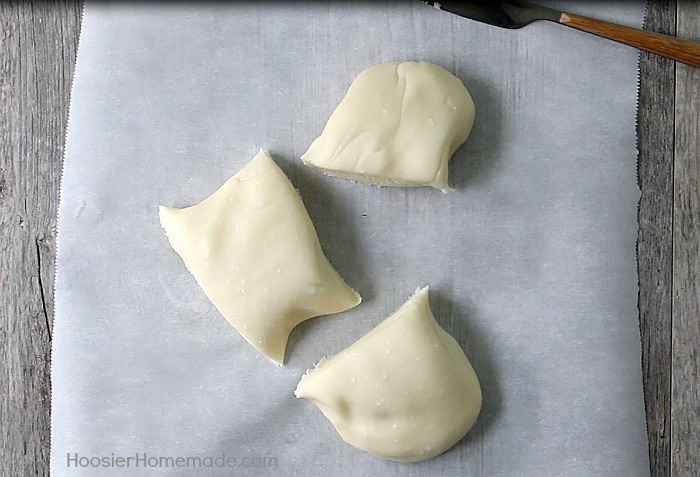 Place candy on wax paper, and allow to cool until you are able to handle it. Knead until all incorporated. 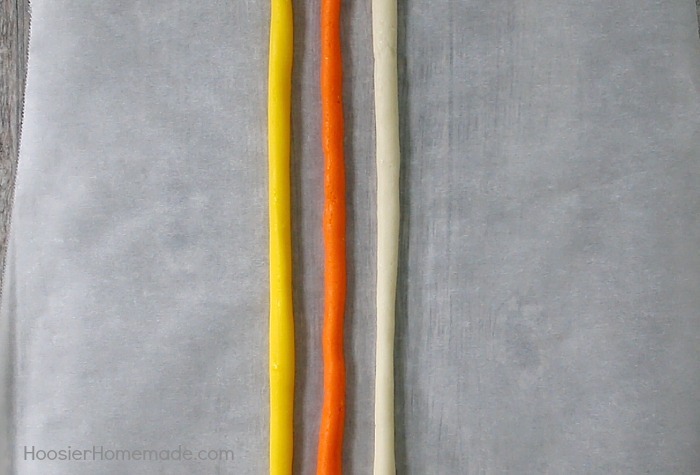 Divide into 3 equal parts and color with Wilton orange and yellow coloring. I used my hands to mix the coloring in, you can put gloves on if you want, but I didn't have any trouble washing off the coloring. Roll each piece into long ropes, trying to keep the thickness close to the same size. Be sure not to boil the mixture too long or the candy corn will be grainy. Adding a little more corn syrup to the mixture when boiling will make the candy corn a little softer. Had I not seen it with my own eyes, I would have said it was impossible! 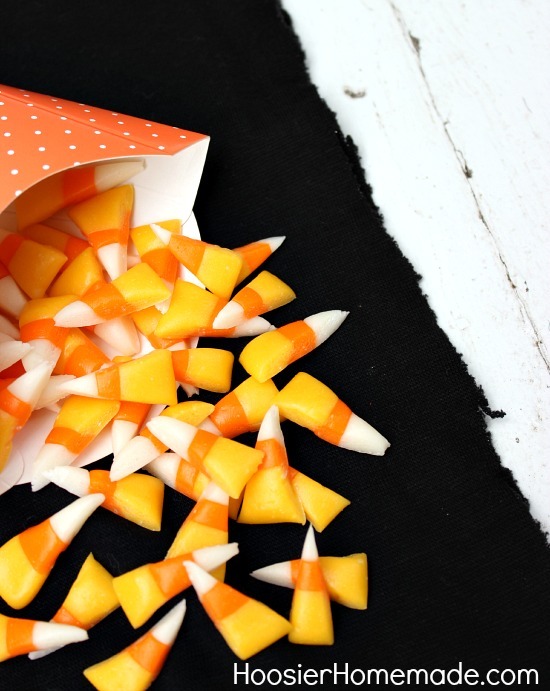 Major kudos to you–not only for trying, but for succeeding in making homemade candy corn. This is so cute! I hope you will come link it to my Halloween party this weekend. It would be a wonderful addition! I’m not a fan of candy corn either but now I want to try this! 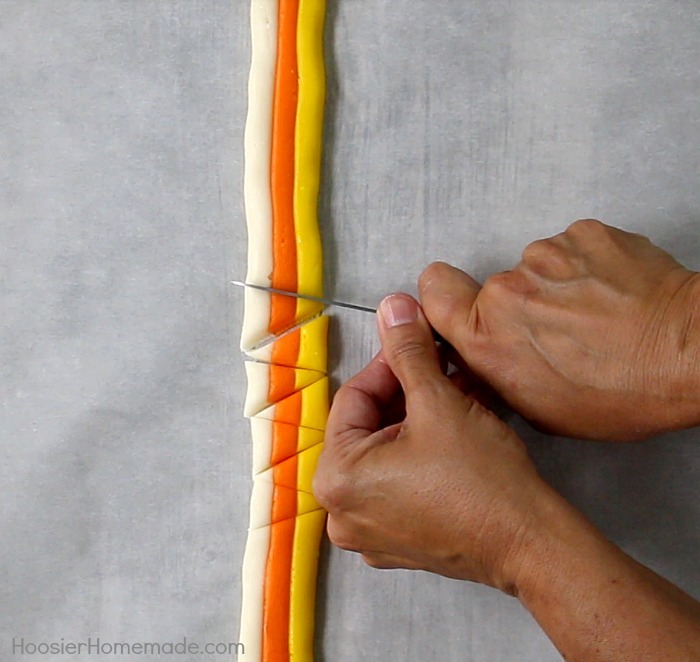 Having the patience to make candy corn – you are truly amazing. Wow, awesome!! they turned out great! Now that looks like fun! Will I give it a try? Probably not this year because I have too much on my plate already. I have made candy in the past though, just not candy corn. So, did they taste like the candy corn in the store? Fantastic .. Looks absolutely stunning!! Good job!!!! CUTE! What a fun project, I know when my daughter sees this she will want to make some with her BFF. They love spending time together in the kitchen! Liz, your cupcakes and candy corn are FABULOUS!!! 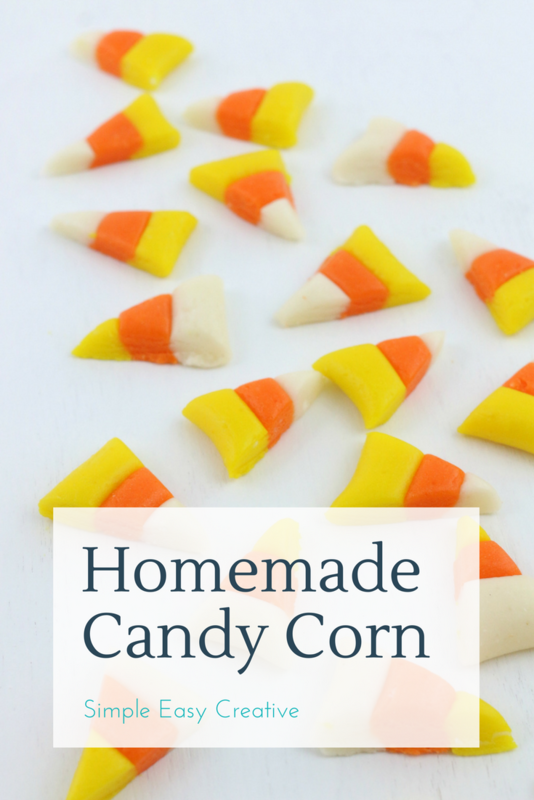 Homemade candy corn?! That’s amazing!!! You are amazing girl! I’m to chicken to try making this! Everything looks beautiful! Oh my goodness those are cute! Never in a million years would I have thought to make my own candy corn!